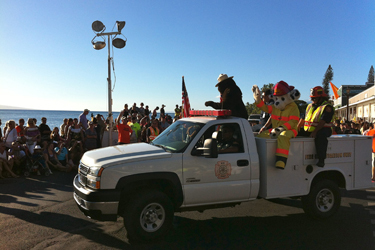 The Giants had their World Series Championship Parade today! Woohoo! 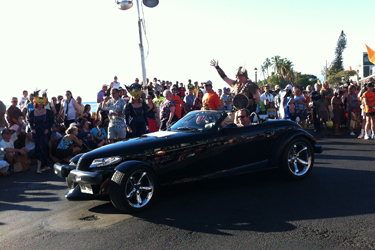 Congratulations to the 2012 Champs! 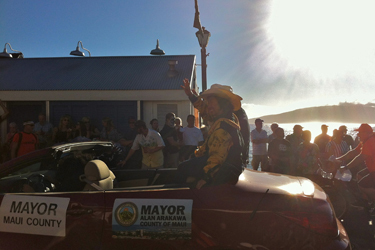 Although I wasn’t home to be able to take part in the celebration with the rest of the City, Mom and I had a parade to go to of our own today. 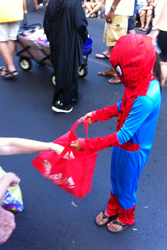 The reason we came to Maui when we did was to see the annual “Halloween in Lahaina” event. 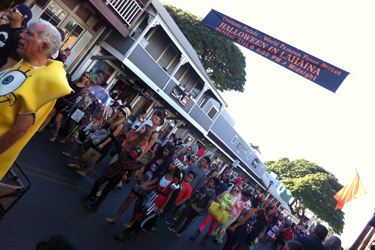 For years and years, both locals and visitors alike come to Lahaina for a Halloween parade and lots of partying. 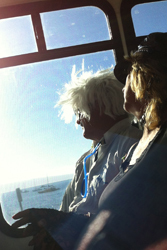 Unfortunately, the event got a bit too crazy a few years ago, and it had to be cancelled for a few years. Now it’s back on, and we decided to check it out this year. 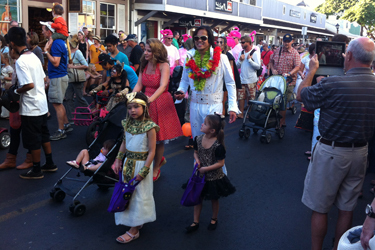 We weren’t sure what the turnout would be, but Halloween in Lahaina, even though it wasn’t officially taking place for a few years, was raring to go this year. 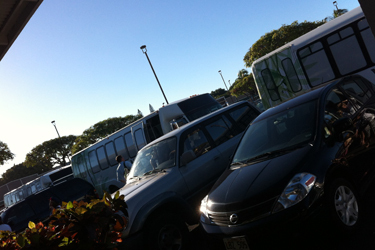 Our hotel had shuttles running continuously, full of guests waiting to take part in the festivities – and a lot of them were dressed for the occasion as well! 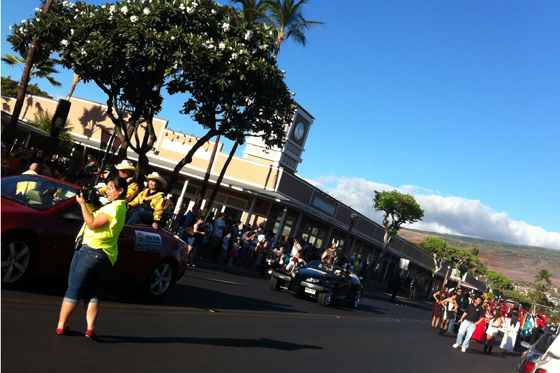 When we got into Lahaina Town, we picked a random street that intersected with Front Street where the parade would take place, and walked down. 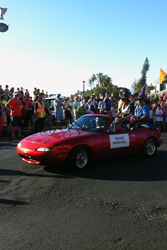 We saw a marching band and a few parade vehicles – we weren’t too late! … and that was pretty much it. 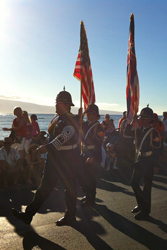 Yes, there was that marching band I mentioned too, but as quickly as the parade started, it seemed to end. 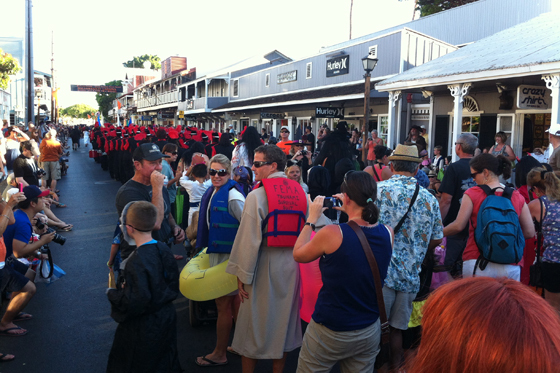 The really awesome thing about the parade part of Halloween in Lahaina is that after what I thought was the parade ended, the public is welcome to become a part of the parade, and march along down Front Street, too! 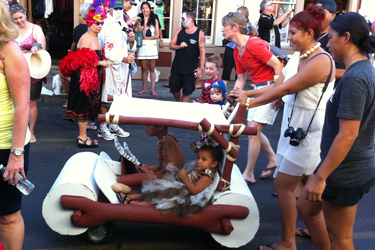 Everyone gets into it – there are some hilarious and creative costumes to be seen, and the spectators on the sidelines pass out candy to the kids. So cool! 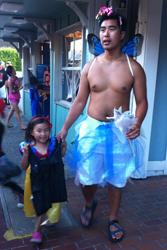 An adorable Snow White with her scantily-clad fairy princess friend – and the Flintstones roll on by! 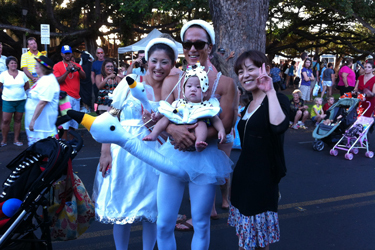 And my two favorites: your basic, run-of-the-mill Japanese swan family … complete with tights and artistically placed swan head tutu for Dad. 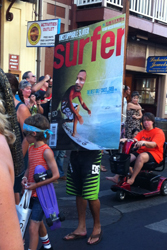 Yeah, that’s right … soak it all in … and finally, straight off – er, on – the cover of Surfer Magazine, Kelly Slater himself. This was so much fun. 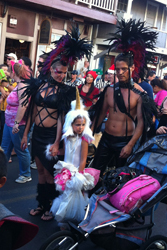 The party lasts all day and night, and of course once the sun goes down the festivities are more “grown-up” and less family-friendly, but we had a fantastic time enjoying the parade and costumes during the afternoon. 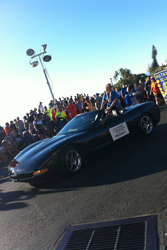 There’s something for everyone, and I’m glad we got to experience this tradition! 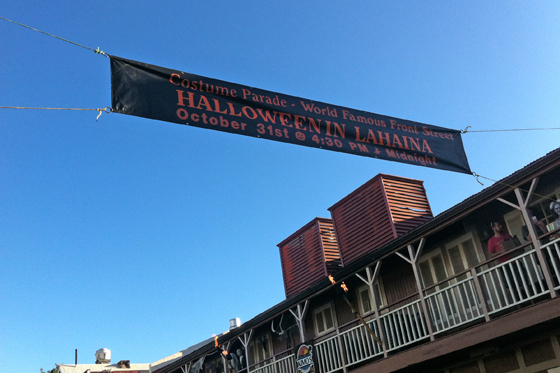 Well done, Lahaina Town!